"As an investor, adviser, and operator in spearheading tech for almost twenty years, Trevor Sumner is no stranger to tackling disruption and coming out alive. His current company, PERCH, has managed to innovate the in-store experience in a way that truly integrates digital. The omnichannel approach that Trevor and his team implement is the kind that takes consumers’ steps towards, touches of, and interactions with a product and transforms them into content- and data-driven experiences that fuel further discovery – and, of course, purchase. In fact, the resulting sales lifts land anywhere between 30% and 80%, a range that retailers such as Neiman Marcus, Kate Spade, and Estee Lauder are willing to bet on. 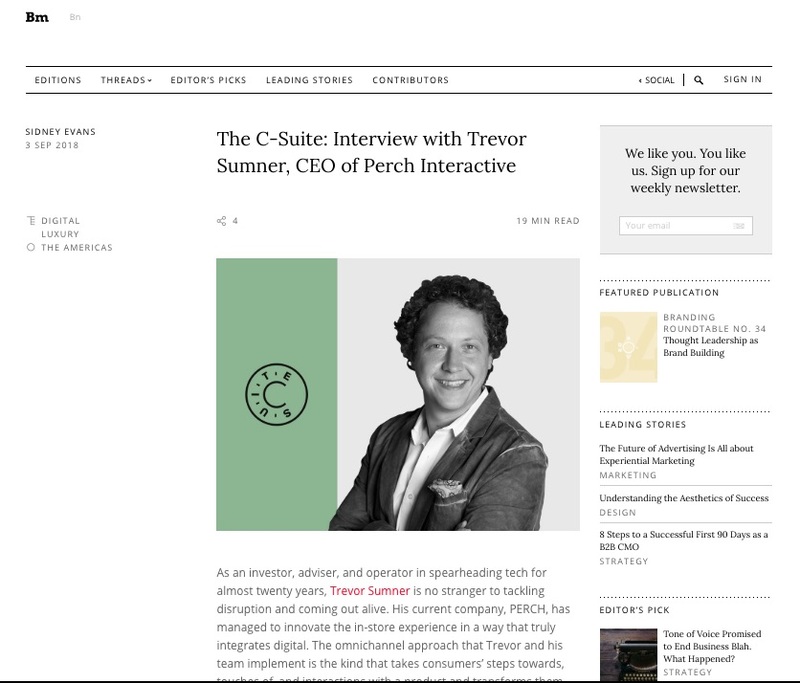 "For all of the reasons above (and more), we decided to have a chat with Trevor and call upon his knowledge across 3D sensing technology, campaign management tools, and device management to see how magical in-store experiences can be built to surprise and delight customers for big and small brands alike." For the full interview, go to Branding Magazine.